Wowza! Wasn’t that a party?! Yesterday was a Sale-A-Bration Celebration to remember! 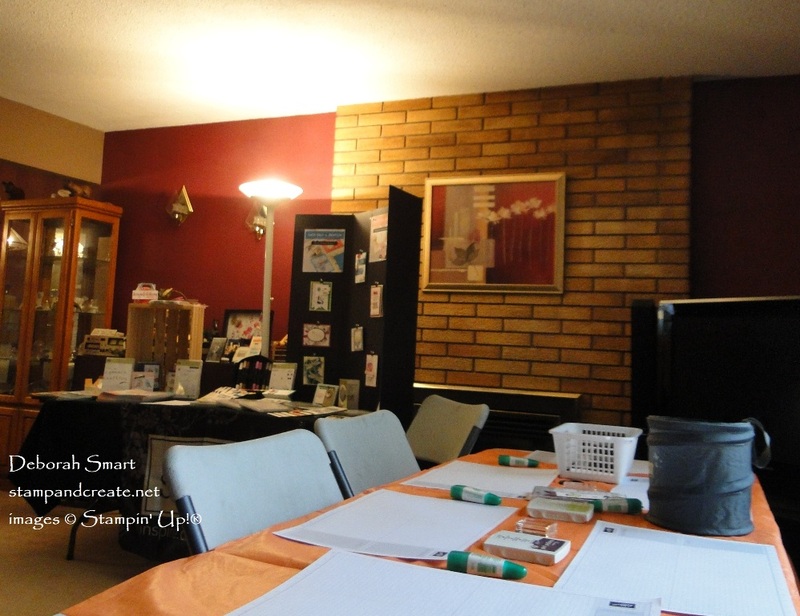 The house was full; full of people, full of laughter, full of creative ideas and fun! Before the party started, I made sure to take some pictures of my setup, because I usually forget to do that. I had my camera left to the side, so I could take pictures during the event – I love capturing people while they’re having fun creating! The joy on their faces is priceless. Unfortunately – you guessed it – I was so busy chatting, sharing, teaching and laughing, that I didn’t get any pictures taken! 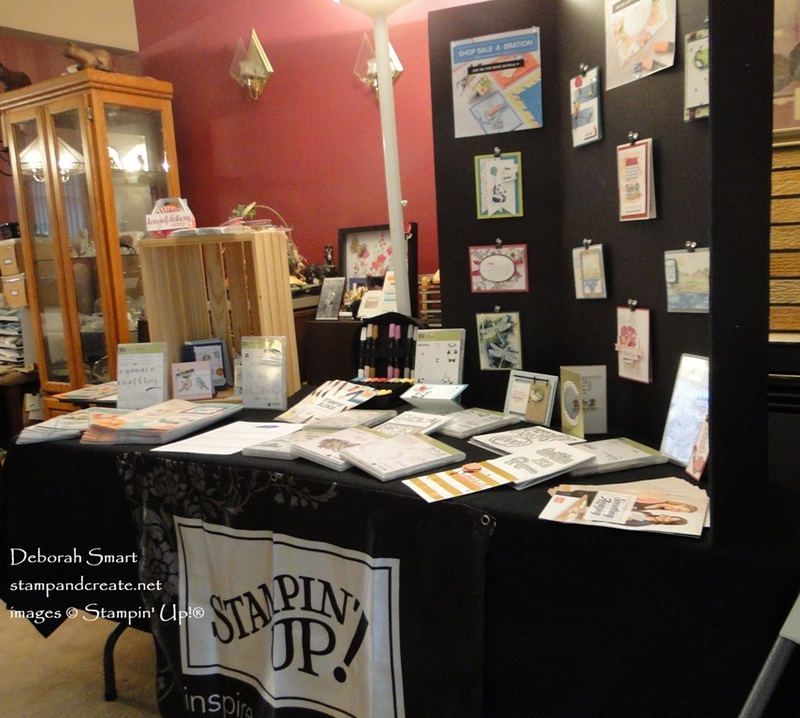 Oh well; I do have pictures of my setup, and of each of my samples and the make & takes. I just wish you could’ve seen the lovely group of ladies who were here,though. One email I received last night, after the event, said “Thank you so much Deborah; just had a terrific time, and so many wonderful ladies! Your projects were certainly amazing and gave us all some great ideas to work with” – M. Receiving that email just made my night! 🙂 That someone not only enjoyed the projects – but the other people, as well! That’s what it’s all about, for me. Truly, the new people and friendships we make. 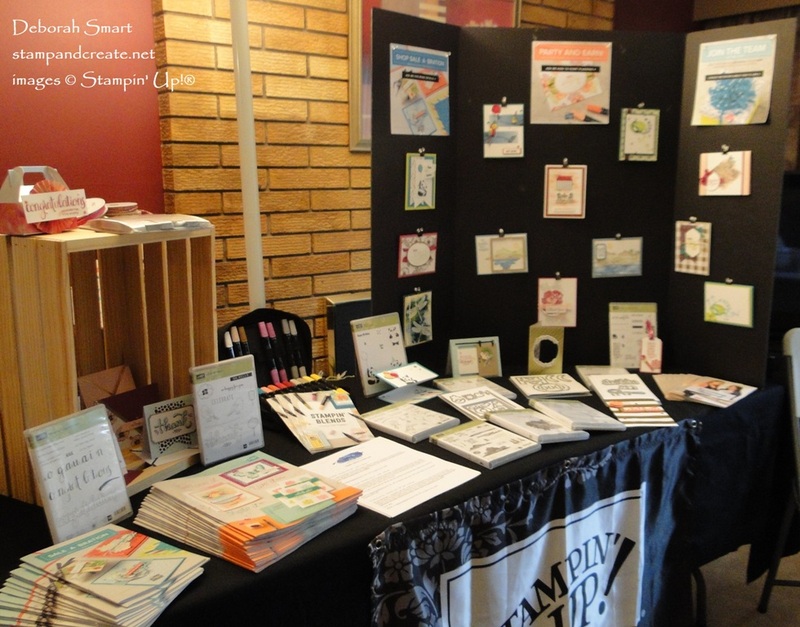 I like having lots of samples on display, and the products on the table to people to see, touch and play with! 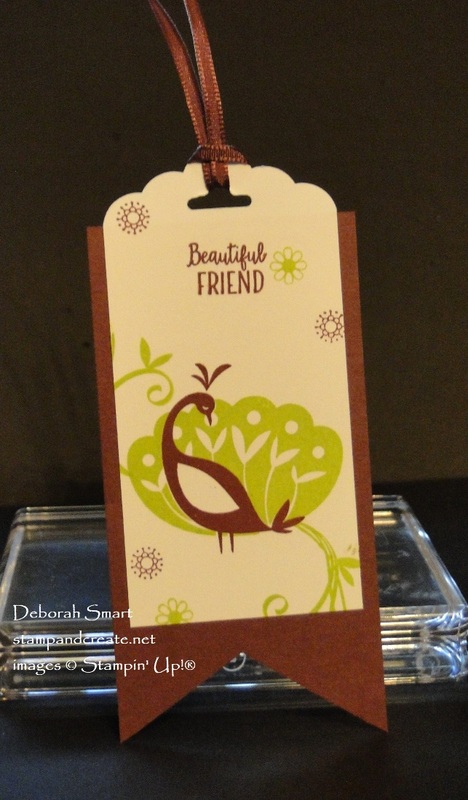 One of the Make & Takes was this gift tag, made using the Beautiful Peacock stamp set, that you can get for FREE during Sale-A-Bration. The tag base is Fresh Fig cardstock, cut at 2 1/2″ by 4 1/2″. The banner tails are made using the Paper Snips. The image piece is Whisper White cardstock, 2″ x 3″. Stamp the feather plumage (behind the bird) first in Lemon Lime Twist ink. Next, add the longer tail feathers; they will stamp partially off the cardstock. Now stamp the bird image in Fresh Fig ink. These being photopolymer stamps, it’s easy to see where you need to place the bird. Stamp the sentiment, from the Beautiful Peacock stamp set, in Fresh Fig ink, above the bird. Finish the stamping by adding 2 different sized flower images in both Fresh Fig and Lemon Lime Twist ink. Punch the top of the image piece with the Scalloped Tag Topper Punch, then loop a length of 1/8″ Sheer Ribbon in Fresh Fig through the hole. Finally, attach the Fresh Fig tag base to the back of the stamped piece, with Multipurpose Liquid Glue. These adorable little pandas quickly become the hit of any party! Don’t let the simple black & white of the panda’s fool you; add your own bright colours in the confetti and balloons! On the Rich Razzleberry cardstock base, attach a panel of Blushing Bride cardstock. Next, attach a panel of Painted with Love Designer Series Paper (found in the Occasions catalogue) to the bottom half. Set aside for now. Stamp the panda image onto a panel of Whisper White cardstock in Tuxedo Black Memento ink. You can leave the balloon uninked, as you’ll be covering it with a heart. Next, use the Sweet & Sassy Framelits and Big Shot to die cut 3 small hearts, and 1 medium heart from another design pattern of the Painted with Love DSP. 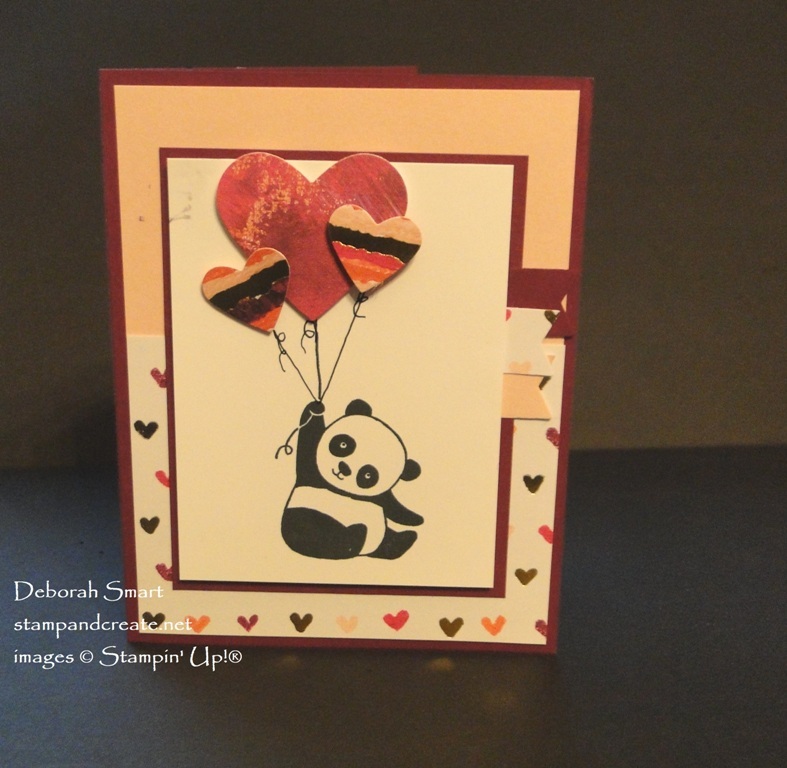 Attach them above the panda, staggering the placement, using Stampin’ Dimensionals. 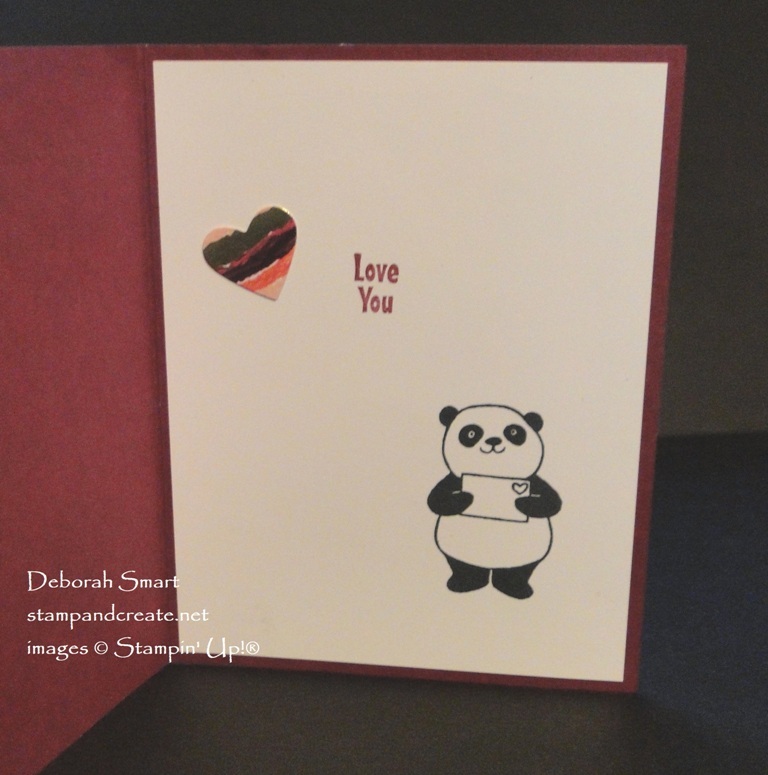 Use the Black Stampin’ Write Marker to draw the additional 2 ‘string’s from the panda’s paw, to the hearts. Next, attach 3 small ‘flags’, made from Rich Razzleberry and Blushing Bride cardstock, and the Painted with Love DSP, to the back, right side of the stamped panel. I used a retired mini punch, or you can use the Bunch of Banners Framelits or your Paper Snips to create yours. The next step is to attach this stamped panel to a 1/4″ larger sized panel of RIch Razzleberry cardstock, then attach it to the card front, with Stampin’ Dimensionals. This picture, above, shows how the layers really add a lot to this card. 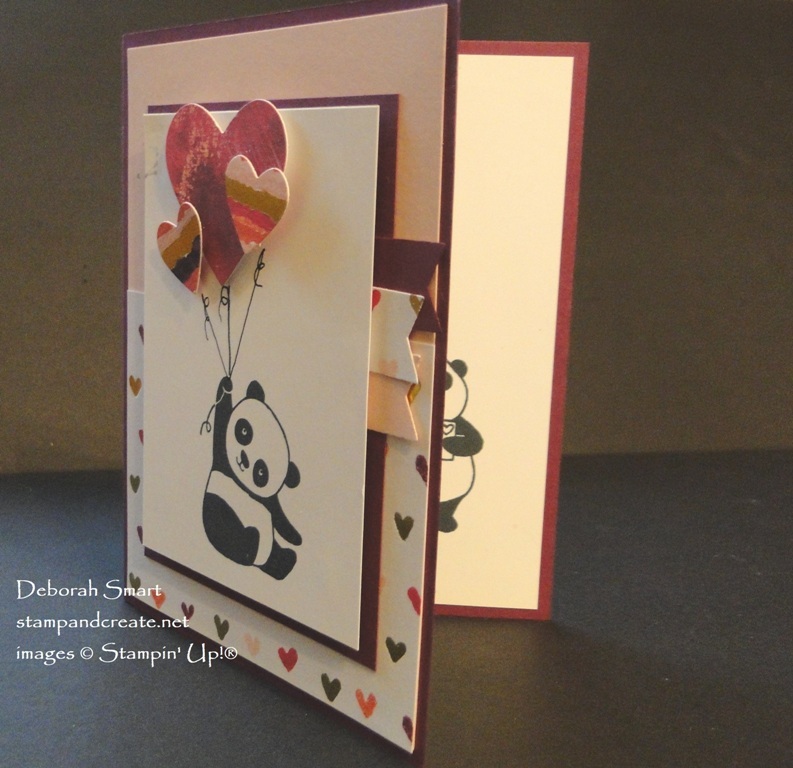 Attach a panel of Whisper White to the inside of your card using the liquid glue. With dark cardstock like the Rich Razzleberry, you wouldn’t be able to see any stamping on it! Next, stamp the envelope holding panda with the Memento ink in the bottom right corner. Stamp the sentiment in Rich Razzleberry ink, then attach the 3rd punched heart next to that. Both of the stamp sets used for the Make & Takes can’t be purchased – you can only get them for FREE! With each qualifying order of $60 , you qualify for 1 of the Level 1 sets, which include these 2 stamp sets. To check out all of the products you can choose for free, CLICK HERE to see them. To order the other supplies used in creating these 2 cards, you can click on either the product images below, or on my signature, to go directly to my online store. It’s open 24/7, so you can shop whenever it’s convenient to you! I appreciate every order that you place with me; without the orders, I wouldn’t be able to keep on stamping, creating and sharing with you! Be sure to check back daily this week, as I’ll be sharing all of the samples cards I made for my Celebration! Looks like a fun party! Love the projects!! You did an awesome job at your setup! I glad it was successful for you. Your cards are adorable! Thanks, Susan! I’m glad to read that you liked the setup; I had to adjust it this year to make it smaller, as I had more attendees!